I don’t suppose that anyone actually dreams of hydrogen, but in the bio-economy there just isn’t quite enough of it and we read about it and sometimes think about it so much that we might as well be dreaming about it. For those newer to the field, one of the problems of using biomass to make a fuel is that a carbohydrate contains around 53% oxygen by weight and needs about 16% more hydrogen that it contains to make a hydrocarbon fuel. That’s one fo the reasons that biofuels are often esters (such as biodiesel) or alcohols (such as ethanol), because those two both utilize less hydrogen and more oxygen than a hydrocarbon fuel. But there are limits on blending — which lead to problems like the E10 saturation point, and that can put a cap on the volumes of biofuels that can be supplied, regardless of demand or price. From time to time here in Digestville we look longingly at anaerobic digesters and the lovely renewable methane and heat that they produce. These are methanogens, belonging to the family of the archaea, that produce methane as a byproduct of their basic metabolism, under anoxic conditions (that is, little or no oxygen). Digesters have been set up all around the country, and generally the purpose of them was to get rid of unwanted waste streams, such as pig or dairy manure — and generate some useful volumes of renewable power from combusting the methane. More recently, there’s been quite a lively market building up for compressed natural gas (CNG) vehicles, and that’s been a good higher-value market option for the purveyors of digester technology and their farmer and municipal clientele. 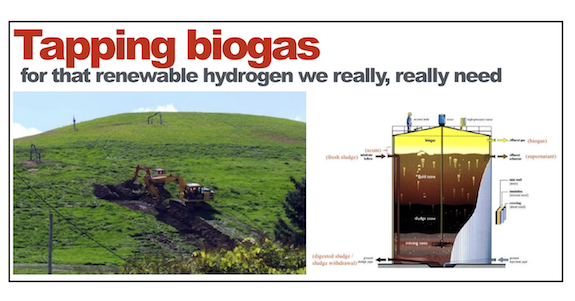 But sometimes we look at that methane stream and the heat that methanogens produce and we wonder if the methane could be better used to produce renewable hydrogen. Steam reformation of methane s a traditional means of generating hydrogen. It’s a process that requires heat energy to drive it, but essentially in this process a bunch of methane is reacted with high-temperature steam, and produces hydrogen, carbon monoxide and a little carbon dioxide. Often, the carbon monoxide is combusted to generate the energy to drive the reaction, producing a hole bunch of CO2 as a result, and that’s one of the reasons that renewables advocates pinch their noses when the use of methane to produce hydrogen is mentioned. Mostly, we use fossil natural gas for this process, and it’s a pesky source of unwanted greenhouse gas emissions. But what if there were other uses for carbon monoxide instead of simply combusting it? LanzaTech’s organism uses CO (and hydrogen) to produce ethanol fuels. Which makes the piles of organic waste that dairies and cattle operations produce a very tempting target. If you have cheap waste oils and some affordable hydrogen, you can sure make a very nice and price-competitive jet fuel, and that’s something that every airline would like to get a hold of. We reported in June 2017 that the U.S. Department of Energy announced approximately $15.8 million for 30 new projects aimed at discovery and development of novel, low-cost materials necessary for hydrogen production and storage and for fuel cells onboard light-duty vehicles. Selected projects will leverage national lab consortia launched under DOE’s Energy Materials Network (EMN) this past year, in support of DOE’s materials research and advanced manufacturing priorities. We reported in May 2017 that “electrical” bacteria are the key ingredient in a new process developed by the Department of Energy’s Oak Ridge National Laboratory that recycles wastewater from biofuel production to generate hydrogen. The hydrogen can then be used to convert bio-oil into higher grade liquid fuels such as gasoline or diesel. The team’s lab-scale demonstration can produce 11.7 liters of hydrogen per day at rates that are required for industrial applications. The hydrogen generated from the microbes could displace the need for natural gas, which is used later in the production process to upgrade bio-oil into more desirable drop-in liquid fuels. You can see that technology highlighted below. We reported in August 2017 that the Linde Group has been awarded with the engineering and supply of a modular hydrogen manufacturing unit for St1 Refinery in Gothenburg, Sweden. Linde’s Engineering Division will start the engineering and construction of the unit immediately, with the completion estimated for the end of 2018. We reported in March 2017 that Preem and Vattenfall have concluded an agreement to investigate the potential of using climate-smart hydrogen gas in the large scale production of biofuel for the Swedish market. The raw materials for this process are forestry by-products and hydrogen gas. The aim is to boost Preem’s production of biodiesel and other fossil-free biofuels to 3 million cubic metres annually by 2030. The hydrogen gas will be produced by electrolysis, i.e. by passing an electric current through water to separate the molecules into hydrogen and oxygen gases.